While the handset is quick enough in use, it disappoints when it comes to GPS, and image quality from the snapper. Plus the CPU isn’t powerful enough to allow smooth running of all the apps. If you’re looking for an Android phone but don’t want to pay out for the top-end handsets sporting Google’s operating system, then a Samsung Android handset could be for you. 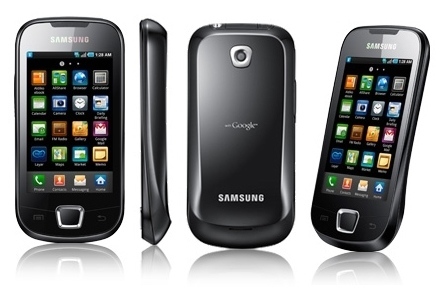 But has the Korean phone manufacturer managed to pull off the budget Android phone without making it cheap and tacky? First off, let’s look at the build quality – which has an upside and a downside. On the front is a 3.2in display set amid a mirrored surround, which appears smooth and well-built. However, turn the phone over and you’ll find a cheap black plastic panel, which appears cheap, far from solid and which will probably end up scratched and dented after you’ve used the phone for a week. Under the bonnet though, the specs impressed us – there’s 4GB of in-built memory and the hot-swappable microSd slot allows you to add up to 32GB more. It’s also good to see a 3.5mm headphone slot and A-GPS. There is a capacitive display, although it failed to prove as responsive as on some more expensive handsets, and certainly doesn’t measure up to the iPhone. For instance, we experienced a short delay when trying to swipe between home screens. The display also fails to be as sharp as other Android handsets – it’s clear that Samsung has cut costs by keeping the resolution at 240x400. However, it does benefit from haptic feedback, so typing emails and texts is pretty straightforward. You’ll also find the TouchWiz 3.0 interface on top of the Android 2.1 Éclair operating system. On the main homepage as a default there is a clock (you touch on this to set up an alarm) as well as shortcuts that take you to the email, internet browser, and a games page as well as the App shop and music store that are Orange’s own. Under these you’ll find icons for messaging, phone, contacts and the app menu. These four remain at the base of the display whatever page you happen to be on. You move to the other up to six home screens by flicking your finger from left to right. Each home screen can be customised, adding your own favourite widgets and shortcuts. We’re particularly keen on the settings widget, which allows you to speedily toggle between sounds on/off/Bluetooth and Wi-Fi, as well as the camera widget, which enables you to flick between pictures and share the via MMS and email. One of the benefits of the Android OS is the opportunity to access the Android Market, which offers a choice of thousands of games, handy bits of software and so on. We were able to play Angry Birds, although we found it a tad jerky. The Galaxy’s 3.2 megapixel snapper is pretty basic – you’ll find it has no LED flash, although it does have auto-focus – and our indoor images were pretty soft and grainy. However, even in decent light outside we found washed-out colours and the lack of contrast were somewhat disappointing. Internet browsing was a more satisfying experience – but thanks to the screen’s low resolution and small size there was a lot of zooming in necessary (luckily, pinch-to-zoom works pretty well). The Android 2.1 operating system does not support Flash when you’re surfing the net. We had high hopes for the Layer Reality Browser, which is a free augmented reality app that superimposes ‘layers’ on a live feed, using the GPS and camera. It is supposed to enable you to play a game of virtual reality Pacman or navigate to the nearest underground station just by walking about. It’s a great idea, but because the Galaxy’s GPS is so slow to get a fix it’s actually pretty useless. We were happier with the battery performance. We had the phone on for a couple of days, running both 3G and Wi-Fi without needing to charge it. The Samsung Galaxy Apollo does offer a lot of the benefits of Android, but bear in mind that some of its features, such as GPS, snapper and display, are not what you’d get on a high-end smartphone. However, if you’re after the benefits of Android (and its apps) but don’t want to spend a fortune, this could be a decent compromise.